The elven girl in the plain white tunic of an initiate lifted her gaze from the green and white mosaic tiles that covered the floor of the royal audience chamber, muttering some appropriate words of gratitude. But if there was a hint of relief hidden in the depth of those slanted eyes the color of ocean waves, the Queen was unable to read it. The quiet murmur of water in the marble bowl of a fountain, shaped to resemble a half-opened orchid, only served to emphasize the awkward pause in the conversation. “Rua’llae, you may go now, this audience is over.” Ellesime concluded with a bright smile and a nod, and watched her young protégé stroll towards a gilded double door, with a slightly pensive expression on her face which bore a striking resemblance to the Queen’s own. Even though Ellesime was able to keep the discontent from her voice, her mood was troubled. She had put great hopes in the receptiveness of this young maiden and had not expected such a candid rebuff. It did not matter that Rua’llae’s rebellion had been stated in terms most gracious and polite – her refusal to even consider Ellesime’s vague proposition was upsetting. This was indeed a day of grievous disappointments and regrets. First Joneleth had not spent the night in the Palace; then there had been a report that Errilam’s bodyguard had been injured in a near-lethal ‘accident’, having fallen from one of Suldanessellar’s many suspension bridges; and now the Queen’s own great-grand niece had refused to even contemplate the human King as a potential suitor. For many years Ellesime had been toying with the idea of finding an elven bride for Errilam of Tethyr. But the idea had remained vague and far-off, until his sudden proposal had made her face a simple fact: over the last few centuries Errilam had been the first ruler on the Tethyran throne over whom she had enough influence to make him care for the Fair Folk and their forests. She might not be so lucky with the next human monarch, thus her timing was crucial. The present King of Tethyr was still in his prime years, regarding both his health and virility, yet he had already turned forty one, and for a human it meant only another decade before entering the age of dissolution and decline. Rua’llae’s family was an old and highly-respected one. According to the ancient chronicles, one of Ellesime’s younger uncles on the mother’s side had been the founder of the clan Greenfyre. Arindeth Starbreeze had departed for Arvandor more than three millennia ago, long before the plains to the south of the Starspire mountain range had been claimed by King Errilam’s ancestors, to form the core of the new country of Tethyr. The Queen of Suldanessellar could scarcely recall her uncle’s face anymore, even in her reveries, but she remembered that he had been quite handsome and had sired children that had grown to be brave warriors and proud defenders of the elven lands. Those children had had children of their own, and although by elven tradition Ellesime had never favored her uncle’s blood over other native Tethyran clans or the families of elven expatriates from Cormanthyr, in the past she had always been able to count on the clan Greenfyre’s loyalty and unwavering support. Today, the Queen had hoped to convince her young relative to make a personal sacrifice to strengthen the peaceful alliance between the two races, but had failed to win the young woman’s heart and mind to her cause. Ellesime herself had been born in a century when the wizards of the human kingdom of Netheril had broken their covenant with elven mages, abandoning the elven ways of gently steering and nurturing the Weave in favor of wrenching greater power from the web of magic that enveloped Toril by force of their minds. That had always been the way of humans, she recalled with some bitterness: under the pressure of their short life-span, they were prone to perform harsh and ill-conceived actions. Perhaps her divine father – the elven deity of forests and woodlands, Rillifane Rallathil, had foreseen the danger of the newly fledged but aggressively growing human civilization that had sprung to life and prospered on the ruins of the ancient elven Empires of Aryvandaar and Ilythiir. He had given her to his children as a gift of love and a symbol of his care for them. By that time the Age of Elves on Toril had passed, marked by the end of The Fourth Crown War, the fracturing of the elven nation, and the descent of the drow into the depths of the Underdark. But the Age of Humans had not yet begun. Ellesime had been a child conceived by an elven woman from a god, born to rule and protect, to reunite the dispersed and disheartened elven clans of Wyrmwood, Darthiir Wood and Tethir into a strong new entity that could have countered the spread of humanity and the slow decline of the Tel’Quessir. All her long and eventful life, the daughter of the Great Oak had fought the never-ending battle with time that had always seemed to work against her and the People. The humans were aggressive, enterprising and above all – fecund. There never seemed to be a lack of newly born babes in their settlements, while the Tel’Quessir had but a bare handful born to a clan in a few decades. In the end, the declining elven tribes had retreated deeper into their ancestral forests, leaving the plains and the seacoast to the human settlers. Yet the humans seemed always hungry for more and more fertile land to feed their numerous offspring, and they used fire and steel to cut their way through the living body of the ever-retreating woodland. Even the fall of the Netherese magical empire, when human flying cities had rained from the skies in a storm of fire and shattered stone, had not brought any relief to the elves, for it had brought even greater calamity on their unsuspecting heads. Netheril had fallen after the human goddess of magic, Mystral (who, from the elven viewpoint, had been only an anthropomorphic personification of the Weave, conjured to life and sustained by the strength of faith of her many human worshippers), had been slain. That had happened when the human mage Karsus had seized the web of magic from the wretched deity, and the goddess had been forced to commit a sacrificial suicide in order to break the mad wizards’ hold on the Weave. Mystral had died, but thanks to the strength of her worshippers’ belief, she had instantly been reborn as Mystra – a new deity of the same power and persuasion, but with the much tighter control over the Weave. After many centuries of veneration of the magic field, the faith of so many humans had had a potent effect on the nature and power of the object of their worship – and the human goddess had truly become the body of the Weave. When Mystral had died, the web of magic that permeated the globe of Toril had contracted in agony, and for a few terrifying seconds had ceased to exist. Even though very few elves had ever worshipped Mystral, her death had had severe consequences on them, for the People were the creatures of magic, and they simply could not survive in a world without a magical field. The reason for that was simple – the Tel’Quessir needed the Weave to maintain their link with the Spirit of Arvandor, as their very souls were interwoven with the Weave in a fine spiritual mesh that was linked directly to the Upper Planes. Every elf born in the world of Toril had this innate link to the Elven Paradise – the blessed Plane of Arvandor. Thus, the old elven proverb said that every elf carried a bit of paradise within her soul, wherever she went. This connection was often referred to as a ‘communal spirit’, and it was that link that granted the People their longevity and eternal youth. Ellesime could still remember the horror of Netheril’s fall: the sharp severing of the link to the Elven Spirit had been nearly enough to wipe out the entire elven population of Toril, and had had a devastating effect on the existing mythals, as well as other long-term elven spells linked to the magical field of the planet itself. Ellesime could never forget that terrible sensation of loneliness – being separated from Arvandor also meant the loss of innate magical abilities, the reverie, and the shared awareness of all other People and Sylvan Creatures as a single spiritual entity within Nature herself. It had felt as if her immortal soul had been slowly pulled out of her body by some invisible force, and although the effect had only lasted a few seconds, the wretched feeling of loss and despair had haunted her for decades afterwards. The Queen had appealed to her divine father for healing and support, and the Seldarine had come to their Children’s help, mending rifts within the wounded souls, and sending more healing spells to the clerics of their respective faiths. In the centuries that had followed the disaster, Ellesime had done what she could to strengthen the People’s position: it was by her inspiration and on her watch when a small group of elven high mages from what once had been the proud elven nation of Keltormir had gathered in the Great Forest of Tethyr to cast a new mythal spell around the mighty trunk of the ancient Arakhor – the mightiest of the elder treants, who had reared and protected the Forest of Keltormir since the dawn of time. The Old Man, later known to many as the Tree of Life, had agreed to accept the burden of watching over the new mythal and its inhabitants, thus sealing a pact with the Seldarine. The elven archmages had sacrificed their lives to cast the spell, and within the invisible shell of the mythal’s protective magics the new city had been built, quickly becoming a shining beacon of elven culture and civilization on the western coast of the Trackless Sea. Far away from the high marble walls of Evereska and the crystal towers of Evermeet the new hope had been born, and the elves of Tethir had named their tree city after the name of the river flowing through the valley, Sul-dan-essellar – the Place of the Shining Wind. Ellesime had been the ruler of Suldanessellar from the day it had been founded, and the Queen and her city were inseparable in the People’s minds. She had become as much the spirit and symbol of Suldanessellar as the city itself was an extension of her flesh. Sometimes, Ellesime felt as if she could ‘sense’ every individual bridge, every talan, every temple, and every treehouse in the same way she felt her limbs or her skin. On the day the mythal had been cast, she had sworn to protect her newborn city from any likely danger, and the threat that could come from the convoluted and aggressively expanding human civilization had been always on her mind. Yet it was not the humans per se whom she perceived as the People’s enemy but rather the mismatch in the two races’ pace of living. If only humans could be taught patience and self-restraint, or elves could share the humans’ zest for life and creative energy. Maybe then the two races would be able to co-exist in peaceful harmony. The Queen shifted her gaze from the string of white flowers embroidered along the hem of her grass-green gown, and rose to her feet. What she truly wanted right now was to retreat to her chambers and seek wisdom in a long revitalizing reverie. Yet even this simplest of escapes was denied to her. She could order the doors of her room barred to all visitors, but alas, she could not stop the flow of time, and this was not a moment when she could afford to excuse herself, even for a few hours. 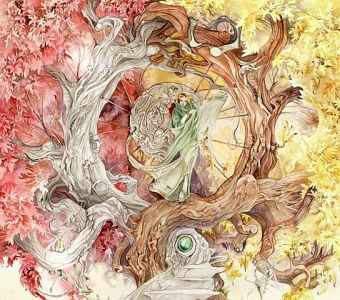 As always, when her mind was in turmoil and her spirit in need of nourishment, Ellesime mentally brushed her spiritual link with the Tree. But for the past few weeks the Old Man had been preoccupied with a severe case of woodborer infestation in the remote southern corner of Wealdath, and all Ellesime could receive from him was a warm wave of reassurance, akin to the patting of a child’s head by a busy adult. Her other link, the one with her frustrated lover and soulmate, remained cold and rigid as an icicle, and so with a sad shake of her head and a sigh, Ellesime gathered her skirts and left the Palace for the only place she could think of in her moment of need – the temple of the Great Oak. “And you think I believe you?” Mirri shook her head in vigorous denial, making the loose strands of her long hair slide over her naked shoulders like a tangle of angry black snakes. They were sharing a broad tree trunk for a seat, inside the strange glade of silvery trees she had discovered earlier. The white cat had returned from one of his many reconnaissance expeditions into the tangle of branches and roots, and was now curled into a ball at Mirri’s feet, purring seductively in his sleep. Mirriam frowned, throwing a furtive glance over her shoulder and quickly switching her stare back to her interlocutor. Indeed, the ground under their feet had solidified into an impenetrable mass of soil and rock, and the hazy pink halo over the ethereal mountains on the horizon had turned into a veritable explosion of bright colors and lights, since all through Rielev’s long-winded monologue the gold and red mélange of dawn had been slowly trickling into the dark grey and bruised purple of the dead sky. “Should I stop now?” Rielev said carefully. The temple of Rillifane was situated on the grand talan lodged between the branches of Suldanessellar’s largest oak tree, as befitted the house of the Great Oak. As with all examples of late elven architecture in Suldanessellar, it looked more like a living organism than a built edifice: a beautiful, ephemeral flower of a building, created by blending Nature’s magic with the talents of elven artisans. Certainly, the planks of polished wood could not have been coerced to flow and curve around the fragile bronze arches that supported the temple’s front doors, to merge with metal and stained glass and form an entirely new architectural entity – and yet there were no other explanation of the structure’s fantastic appearance. Yet inside the temple, the design was quite simple. The Main House of the Leaflord in Suldanessellar contained only a round sanctuary with a large statue of Rillifane Rallathil wrought out of living wood, and a few side chapels dedicated to the minor deities of the elven pantheon that were Rillifane’s closest allies and friends. The rest of the Seldarine, including the head of the pantheon, Corellon Larethian, and such major gods as Labelas Enoreth, Sehanine Moonbow, and Hanali Celanil had their own places of worship nearby. But the Leaflord was Suldanessellar’s divine patron and his temple was the most important building in the ‘holy quarter’ of the tree city – if such a definition could even be applied to an entity like Suldanessellar that grew and burgeoned in three dimensions instead of two. Finishing her prayers and meditations, Ellesime rose from her kneeling position before the great statue of Rillifane, trying to identify a portent or read a sign of empathy, however fleeting, on the Leaflord’s broad wooden face. But her father’s features remained impassive and today the daughter of the Great Oak could not merge her mind with his, however hard she tried. The giant masks of Rillifane’s allied deities, crowned with feathers and flower buds, watched her from the shaded niches in the curved walls but remained as silent and remote as her divine Sire. Perhaps the Leaflord’s silence was a sign in itself, Ellesime realized belatedly. The sacrifice had to be made by her alone, and the choice had to be her own, as much as it had been Rua’llae’s right to refuse the Queen’s appeal. If Ellesime chose to forfeit her personal happiness for the sake of safety and prosperity of her beloved city, the final decision would have to come from her heart. The Queen dipped the fingers of her right hand into a bronze basin with holy water and touched her forehead in a gesture of humble acceptance of her father’s verdict. There was, perhaps, one more counselor of whom she could ask advice, even if it meant hearing her own thoughts repeated back to her from another person’s mouth. Leaving the sanctuary by the back door, Ellesime ascended the near-ethereal stairway winding up the tree trunk to the upper branches of the giant oak that supported Rillifane’s temple. Here, well above the busy avenues of the city’s main suspension bridges and the broad platforms that supported the residential dwellings, Demin, the recently elected high priestess of the Leaflord, reared her hanging garden of faith. This exotic arboretum consisted of a few landings and balconies spilling over with burgeoning vines and bushes, and connected by a network of rope bridges and ladders. The talans that supported the garden were almost completely concealed beneath the thick masses of green plants, now and then accentuated by a few carefully planned details: a small shrine of crystal and bronze, a set of silvery wind chimes, a marble statue of an elf child holding a dragonfly, or a sundial with a sculpture of a winged pixie at the center. Here, beneath the open sky, the plants never lacked for direct sunlight or rainwater, and the priestess’ magic provided additional nourishment. Due to these favorable conditions, many shrubs and grasses that at the ground level would have barely reached few inches in height, had formed a thick green canopy trailing over its ornate railing like the green locks of sleeping dryads. Small rainbows flashed between the dripping leaves of fruit-bearing vines, electric-blue butterflies fluttered among the foliage, and the sea of trees down below made the place look surreal – a flying ship, carrying forth its green fragrant cargo on the winds of eternity. Heartened by the sight of Demin’s aerial kingdom, Ellesime followed the path that led to the hub of the main talan, until at the very center of a broad platform she finally spotted the familiar figure in robes of green and brown, bent over an ailing plant. Perhaps the high priestess of Rillifane was too young to be elevated to this lofty position, yet Ellesime trusted Demin more than many venerable clan leaders in Suldanessellar’s Council of Elders. The high priestess was one of the most skilled healers in the tree city, utterly selfless, and blessed with the favor of Rillifane himself. Here, in the privacy of her sacred garden, Demin looked confident and secure, something she usually lacked at major public ceremonies. “I am not a small child, neither am I an invalid. And your staircase did not grow longer since my last visit,” was the Queen’s stark reply. Yet despite all Ellesime’s protestations, the priestess gently but firmly pulled her by the hands into a small gazebo, covered in clinging white roses, and swiftly arranged the soft silken pillows on a wicker bench. “For the sake of our long-standing friendship and political stability, I nearly convinced Errilam to take a different elven bride. I also tried to plead with my young relative to take my place,” Ellesime replied listlessly after taking a sip of cold water. The rounded sides of her silver cup had already clouded with mist, for Demin’s fountain had a small enchantment placed on it, keeping its waters perpetually chilled. The drink had pleasantly cooled Ellesime’s mouth but her mind remained aflame with passions and fears. The sudden fit of panic that had come over the Queen at the thought of losing her lover had shaken her to the core, and Ellesime’s thoughts were still clouded with emotions. Over the many centuries of her rule over the Tethyran elves, Ellesime had outlived a few consorts, but never before had she been in a relationship that consumed her so completely. Much to her surprise, even toying with the idea of losing Joneleth was too painful to sustain. Still, her small woodland kingdom did not possess the natural defenses of the great elven strongholds like Evermeet or Evereska, and it was her duty as a monarch to assure its safety by all possible means. If she was to accept Errilam’s proposal, it would mean not only long-term security for her Children, but perhaps a new era for the two most prominent races of Tethyr, united into a single family, and perhaps giving birth to an entirely new civilization. “How can I ask a young maiden to sacrifice her heart on the altar of communal need if I am not capable of it myself?” Ellesime continued sadly, seeking an answer more from herself than from her unhappy advisor. Now she deeply regretted never sharing her plans for the renewed marital alliance between the Tethyran elves and the humans with anyone but Joneleth. But even with him, it had always been an extremely touchy subject. And after yesterday’s night, her beloved magician had simply vanished from her sight, leaving her to brood over her new predicament alone. “I fear my Lord Rillifane was displeased,” Ellesime finally forced herself to admit, yet her heart was trembling with hope for plausible opposition from the priestess. Demin did not disappoint her in the slightest. “Errilam would never do such a thing!” Ellesime replied with conviction. “Yet I fear he will hold me responsible for deception.” She put the goblet aside, nervously crushing the delicate fabric of her silky drape in her hands. “Over the years of our friendship he has convinced himself that I am free to answer his affections. How can I explain the elven bond to someone who has no connection with the Spirit? It is like trying to discuss music with a deaf man. No, Demin, my grief is not over what will happen, but rather over what will never come to pass should I refuse Errilam’s bid for my hand: a Kingdom prosperous and united under a dynasty that bears the blood of two races in its veins, the People living in peace and harmony with their human cousins, teaching humans the ways of Nature, and perchance, acquiring some of their passion and vitality in return.” Through all her speech Ellesime’s fingers continued to play with the silk almost tearing it apart, until she suddenly noticed her own action and dropped the tortured frill, stifling a sigh of embarrassment. Ellesime turned around, greatly distressed at the notion of being spied upon all through this private and highly sensitive conversation. But the sight of a beautiful elf-maiden in a long wine-colored dress belted with a rich girdle of golden thread instantly softened the Queen’s indignant stare. The intruder had entered an open porch of the small pavilion, and dropped to a kneel before her Queen in a most reverent fashion. “You should have made your presence known,” Ellesime shook her head with a sad smile, pointing to Demin to stop intimidating the object of her righteous chastisement. The priestess grumbled but stepped aside, allowing Bodhi to speak directly with the Queen. “Your secret is perfectly safe with me, you Majesty.” Bodhi’s courtly bow was as deep and profound as her cleavage. She was never one to neglect or upset her superiors, and her conduct with Ellesime had always been flawless, however much she truly hated and despised her divine ‘sister-in-law’. In the past, fooling the Queen had been almost too easy a task, as even Ellesime’s frequent disagreements with her lover resulted in her showering Joneleth’s mother and sisters with more signs of royal affection. Bodhi read this behavior as a sign of hidden weakness, for it showed that Ellesime always tried to appease Jon, even when she seemingly spurned him. Today fate was clearly playing into Bodhi’s hands, and it was up to her to exploit the situation to its full potential. “My dear sister and friend, I have no words that will suffice to express the full extent of my surprise,” Ellesime’s voice trembled with emotions, and the prevailing ones in the spectrum of her feelings were those of gratitude and relief, slightly tempered with uncertainty. Arakhor – an elder treant. Akin in some respects to elementals, the arakhora draw life, energy, and intelligence from the forest in which they dwell, and give back a forest's energy by serving as caretakers and guardians. Arakhor Patriarch possesses powers similar to that of a demi-god.